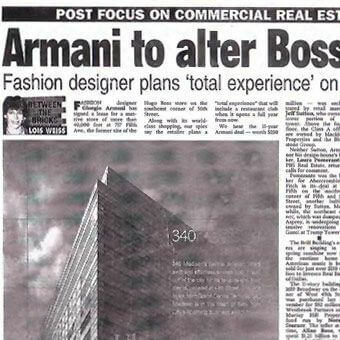 Armani to Alter Boss Site; Fashion Designer Plans “Total Experience” on Fifth Ave, by Lois Weiss. We hear the 15-year Armani deal - worth $250 million - was orchestrated by retail maestro Jeff Sutton, who owns the lower portion of the tower. Above the fourth floor, the Class A offices are owned by Macklowe Properties and the Blackstone Group. Neither Sutton, Armani, nor his design house's broker, Laura Pomerantz of PBS Real Estate, returned calls for comment. Pomerantz was the broker for Abercrombie & Fitch in its deal at 720 Fifth on the northwest corner of Fifth and 56th Street, another building owned by Sutton. Meanwhile, the northeast corner, which was dumped by Asprey, is undergoing extensive renovations for Gucci at Trump Tower. The Brill Building's owners are singing in the spring sunshine now that the onetime home of American music is being sold for just over $150 million to Invesco Real Estate of Dallas. The 11-story building at 1619 Broadway on the corner of West 49th Street was purchased last November for $92 million by Westbrook Partners and a Murray Hill Properties fund run by Norman Sturner. The seller at the time, Allan Rose, then spent $1.25 billion to buy the nearby 5 Times Square trophy building. The Brill Building is still home to entertainment folks. Sound One and Lorne Michael's production company, Broadway Entertainment, take up 80 percent of the office portion, with songwriters such as Paul Simon still occupying small offices. Colony Records holds down the major retail. The 177,000-foot Art Deco Class B office building has high ceilings along with a penthouse and rooftop terrace with spectacular views of Times Square. Some 50,000 feet in air rights are included. Sturner tells us that it was not for sale but when he suddenly got three unsolicited offers, they hired Douglas Harmon and Adam Spies of Eastdil Secured to take it public. "There were 119 inquiries and it became a New York feeding frenzy," Sturner said. "We narrowed it to three or four people and [to avoid selling within one year] told them to come in hard with a closing in November. I just couldn't walk away from the profit." Sturner is closing on the purchase of 1180 Sixth Ave. in two weeks and is now scouting for a replacement purchase for the Brill.